US Secretary of State Mike Pompeo earlier said that sanctions will stay in place until Pyongyang shows its commitment to the process of denuclearization of the Korean Peninsula. A recent statement by the North Korean Foreign Ministry has said the country may shift back to its policy of "pyongjin", suggesting equal development of the economy and nuclear armaments, if the US does not change its approach and keeps up its sanctions against Pyongyang, AP reported. At present, the DPRK maintains a policy of directing all the country's efforts toward economic development while freezing its nuclear program. The statement noted that "improvement of relations and sanctions" are two incompatible things and urged Washington to lift economic sanctions in response to the DPRK's "proactive and good-will measures" of unilaterally halting nuclear weapons and intercontinental missiles tests. "If the US keeps behaving arrogantly without showing any change in its stand, while failing to properly understand our repeated demand, the DPRK may add one thing to the state policy for directing all efforts to the economic construction. The word 'pyongjin' may appear again," the statement said. In an interview on November 2, US Secretary of State Mike Pompeo said that Washington will continue to exert economic pressure on the DPRK until Kim Jong-un fulfills commitments made by him to US President Donald Trump during their joint summit in June. Pompeo also shared that he is planning on meeting his North Korean counterpart in the near future, but hasn't specified when or what the agenda for such a meeting would be. This is not the first time North Korea has warned the US that denuclearization won't work unilaterally. 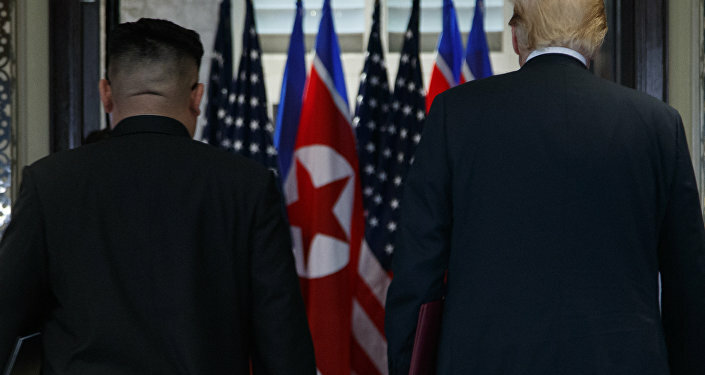 At the end of September 2018, Pyongyang urged the US to take "simultaneous gradual steps," saying that the principle of "denuclearization first" in combination with economic coercion only "increases [North Korea's] distrust." Since the DPRK committed itself to abandoning its nuclear armaments research several media reports have suggested that in fact it never did so. This information has never been confirmed by either the US or the DPRK. The US president and the DPRK's leader met at the Singapore summit in June 2018 to discuss relations between the two countries. The two agreed to start the process of denuclearization of the Korean Peninsula in exchange for guarantees of safety for the DPRK and lifting of economic sanctions.